"I want to live life and be happy and not worry about what anyone thinks. I want to try to be the best I can be and leave the world better off than when I entered it." Andrea Joy "A. J.” Cook (born July 22, 1978) is a Canadian actress best known for her role as Supervisory Special Agent Jennifer “JJ” Jareau in the CBS crime drama Criminal Minds. Cook was born in Oshawa, Ontario, and spent most of her life growing up in Whitby where she attended Anderson Collegiate Vocational Institute. She has three siblings: Nathan, Paul, and Angela. Cook was declared legally blind in the second grade because of a severe astigmatism, but wore contacts and thick glasses to correct her vision. She eventually underwent surgery in 2007 where a lens implant was used to correct the impairment. A dancer from age four, Cook began taking jazz, tap and ballet lessons. She danced competitively for many years and also taught dance, before deciding at the age of 16 that she wanted to try acting. Cook's first job was in a McDonald's commercial in 1997. She graduated to series work with a guest role on the television series Goosebumps, and parts in two television movies. Cook launched her feature film career as one of five captivating suicidal sisters in 1999’s The Virgin Suicides. Also that year, she took a starring role in the TV series Higher Ground where she met her best friend, Meghan Ory. Cook then captured leading roles in several films, including Out Cold and Ripper. On August 3, 2001, she married her long-time boyfriend, Nathan Andersen, whom she met in a film class at Utah Valley University. She later moved to Salt Lake City, Utah to be with him. AJ’s career continued to grow as she appeared in films such as I’m Reed Fish, and Final Destination 2 and season one of the TV series Tru Calling. The couple then moved to Los Angeles, California to further Cook’s acting career. Since September 2005 she has starred as Jennifer "J.J." Jareau in the hit CBS drama Criminal Minds. On September 13th, 2008 their son, Mekhai Allan Andersen, was born. On June 14, 2010, it was announced that her contract option would not be picked up for season six as a series regular reportedly due to "budget cuts" on the show. Cook starred in the Lifetime movie, Bringing Ashley Home, indie flick Least Among Saints and guest starred on Law and Order: SVU during this time. Due to thousands of letters and petitions written to the show's producers for Cook’s return, on April 16, 2011, it was reported that she had signed to again become a series regular on the show. In 2013, it was announced she was hired as a spokeswoman for Proactiv and her movie Wer was released. She appeared in the January/February 2014 issue of Maxim magazine and was ranked #88 on the Maxim Hot 100 2014 list. 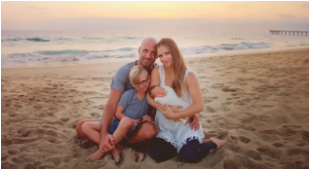 On July 23rd, 2015 their second son, Phoenix Sky Andersen was born.